These are not your mother's fig newtons. Not even close, unless your mother is a cook-from-scratch Italian who raised her children behind the family grocery store in 1950s Cleveland. For this recipe is from actor Vincent Romeo's memoir, Behind the Store, in which each chapter is organized around one of his mother's treasured recipes. My kind of book, indeed. I bought the book at a reading at the Cornelia Street Cafe in the spring (the DH's latest book, Leaving Story Avenue, was featured at the same event) and put it aside until last week when Josephine, a wonderful-in-every-way co-worker, brought me fresh figs from her father's fig tree. 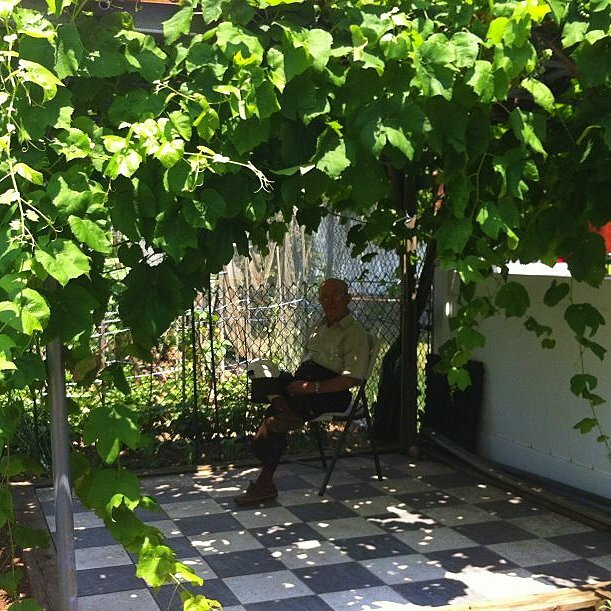 This is not just any fig tree -- her father brought the cutting that spawned this tree from his native Italy 50 years ago and planted it in his new homeland in New York. It has flourished ever since -- just look at these gorgeous figs. I truly planned to use these delicious figs in the recipe, but they were so good that I kept eating "just one" and before I knew it there was "just one" left in the bowl. 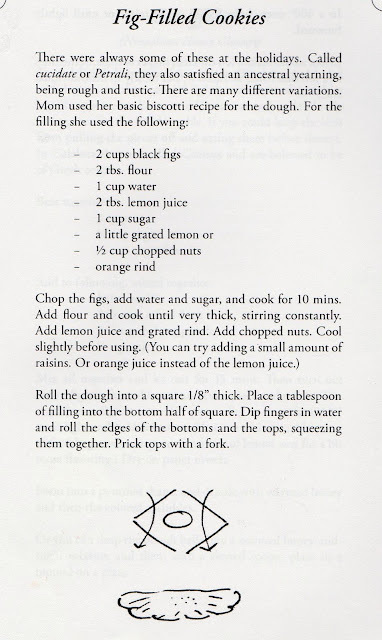 Luckily, I was able to buy some fresh figs in the market which, though not nearly as good, worked well in the recipe. Now, these are not the easiest cookies to make, nor are they the most beautiful, but I suspect with practice they can be both. 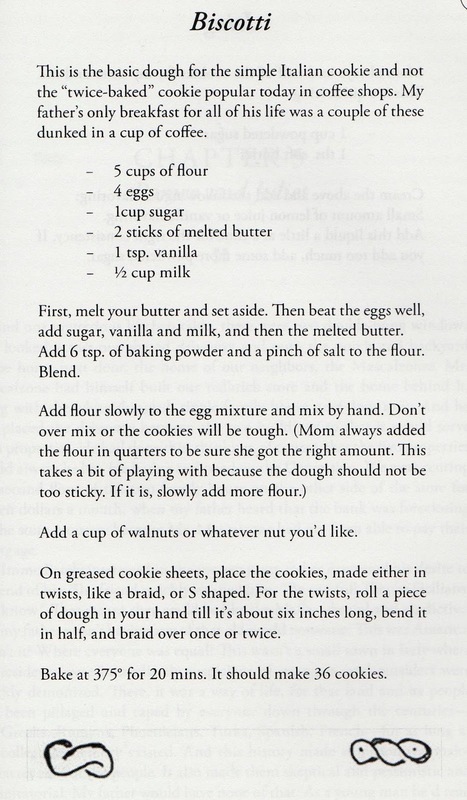 The dough -- from Mrs. Romeo's recipe for biscotti (but not the twice-baked biscotti popular today) -- is a bit tricky to work with. She made S-shaped cookies with the dough and her husband ate them for breakfast every morning. At holiday time, she repurposed the dough for these treats. No need to wait for a holiday. 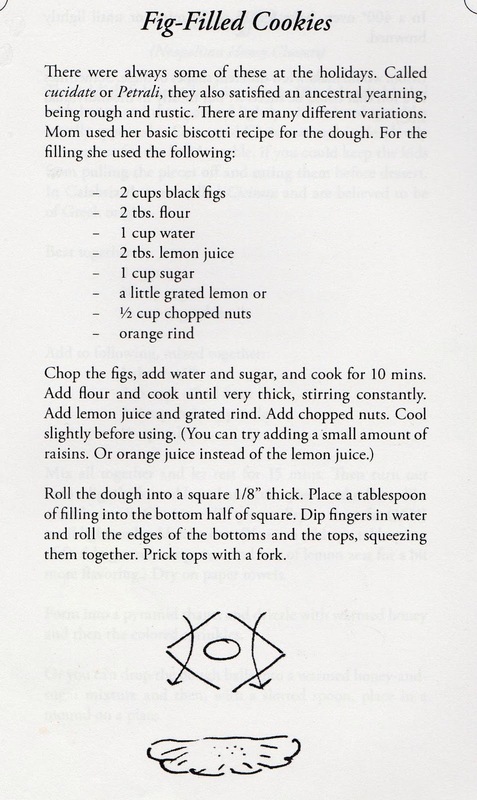 First, chop the figs and cook with water and sugar. Wait until the liquid reduces a bit and then add flour, lemon and chopped nuts. While the filling is cooling, make the dough and roll it out on a lightly floured surface. 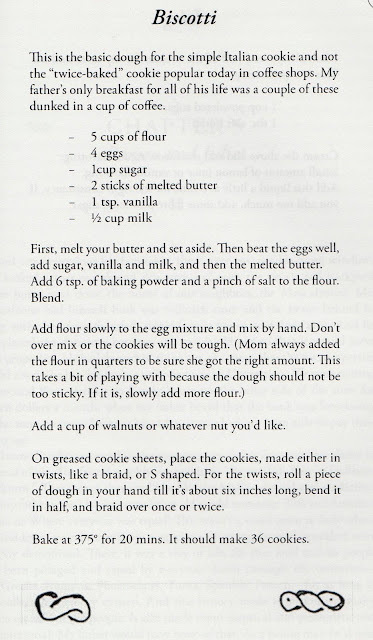 I followed the instructions (at bottom) for the first few cookies, but thought that it was yielding a poor filling-to-cookie ratio, and it was slow going besides, so I streamlined the process, below. Although I've never made ravioli, I used a similar technique and efficiently prepared four cookies at a time. The recipes are below. You'll need to improvise a bit, but that's half the fun. I baked them at 350 degrees until they were golden. Let cool before enjoying. Looks great - like mini fig pop tarts. Thanks for sharing. I've never worked with figs before. TV, I strongly recommend working with figs. One of God's greatest gifts -- sweet with zero Weight Watchers points. What could be better? 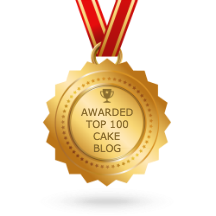 Thanks for writing! How to Separate Eggs -- Like Magic!